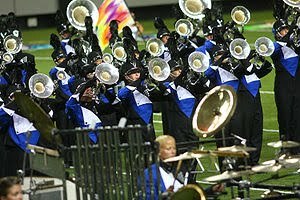 Blue Knights photo courtesy of Wikipedia. Last night John took me to Corps Encore, and I was all, "Okay, you giant nerd (tall and handsome giant nerd)," but you know what? I actually enjoyed it! We only watched three corps, which helped, because I don't think I could take three hours of it. But it is crazy to watch! It's like that part in the rodeo where the sheriff's posse weaves in and out and around each other and you're just sure there's going to be a head-on, but there never is. One of the corps had their color guard in harlequin/jester costumes that I loved, and they were juggling sabres and rifles and flags and shower curtain rods . . . plus there are guys out there who are full-on running, holding a contrabass (a tuba-thingie) at arm's length. They are way strong. John said when he was in it he would eat probably 5000-6000 calories a day, and he still lost ten pounds over the summer. For breakfast he'd have seven or eight bowls of Lucky Charms, plus a few PBJs. That's nuts. I'd probably go again. I wish they played more pop music, though. The Blue Knights played "Can't Take My Eyes Off Of You" for their encore, and it was my favorite part of the whole night. Nobody played "4 Minutes," which is a crime. I had better hear it played by a marching band in a parade sometime this summer, or else. Ganked from someone in Oregon, here's the song I liked. If you want to get your band geek on you can find a wealth of videos on You Tube of them moving all over the place. Ok, that's way cute. And actually, I look forward to the day when Daniel drags me to one of those thangs. He gets so excited whenever he talks about it, and we have spent some time watching crazy amazing videos of Drum Corps action on YouTube. I had no idea just how demanding it was. No wonder all those marching band kids in high school came back to school after summer break with fierce tan lines and they looked like they'd been working out 10 hours a day. 'Cause they were. exiockis there another time soon to see them and where? One time I ate five boxes of Lucky Charms for breakfast. Also, you know you're a redneck when you start comparing things to the horseback sheriff posse at the rodeo. Nate, someone who wears boots as big as yours had better be careful who he calls a redneck. Especially since I never said they were on horseback, but you knew anyway, you hillbilly! The excitement never ends for you all, does it? !